Update the look of your '10-'15 Chevrolet Equinox with our Rear Lid Trim Decal kit. Available in a wide variety of colors, decal set is designed to be placed directly on top of the existing Chrome surface of your Equinox's Rear Lid Trim as shown. Decal is PRECUT and ready to apply - NO TRIMMING required! 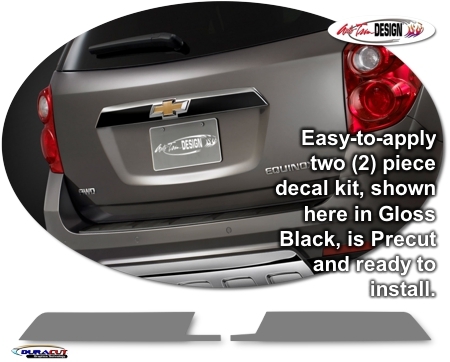 Our decal kit consists of prefitted and contoured pieces that are specifically made for the '10-'15 Chevrolet Equinox factory Rear Lid Trim and will not fit any other vehicle. Decal is Vehicle Specific. Thus, it will not fit any other vehicle and/or year range.